address the underlying causes of deforestation. InfiniteEARTH markets triple-gold certified REDD+ carbon credits on a wholesale basis for organizations seeking to address their carbon emissions footprint with a world-class and highly accredited offset initiative. InfiniteEARTH’s Triple-Gold Certified REDD+ Carbon Credits specifically underwrite the protection of biomass and carbon sequestration mechanisms providing 1 tonne of avoided tCO2e emissions in perpetuity. They are backed by projects which pursue long-term strategies for addressing the underlying causes of deforestation and degradation and implement strategies for the sustainable management of existing forest stocks. 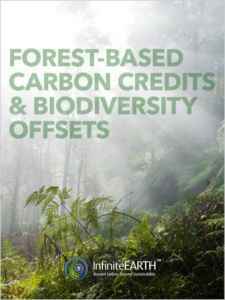 Contact InfiniteEARTH to discuss how our REDD+ Carbon Credits can work for you.